Now what is this, you may ask. The magic computing shoe? A sensor setup to registrate the smell of my socks? Nope. 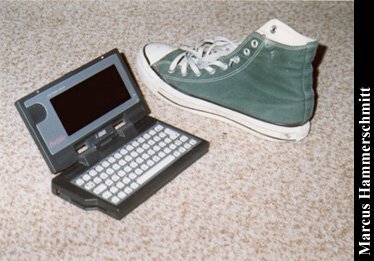 This upgraded pocket calculator with a trainer of a very popular american brand shown for comparison in size is the mother of computers. Don't believe it? Here we go. 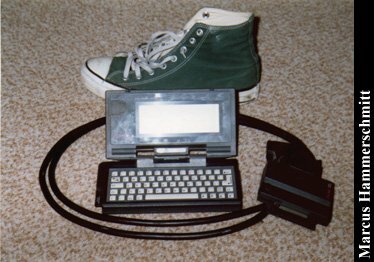 When I bought this marvel of technology in 1989 for about $400 (which was outrageously overpriced, to say the least), I had already worked with an Apple IIc and a Zenith PC, both outdated when they shew up on my roommates desktop in the mid eighties. Wanting desperately something of my own, I opted for the "smallest PC of the world" as the Portfolio was named by the press here in Germany. Spending said money on the machine was hard, especially if you count in the $150 I had to let go for an additional RAM card of 128 K, but spending $2000 you had to put down on your dealer's table for a grown up system was outright impossible to me. I was very proud of my new achievement. My friends laughed at it, especially the small keys on the keyboard (which are incredibly small) gave reason for many a joke. Since I've got rather large hands, keys might have looked all the more disproportionate. The Portfolio took for revenge when my first radioplay got aired, which had been written in its first version using its very ROM based word processor, which to call "basic" or "simple" is a euphemism. No text formatting whatsoever. But the revenues for the radioplay got me my first real computer, a 386 machine, to which the Portfolio connected without complaint. And know what? My current Pentium doesn't mind either, thanks to the otherwise cursed DOS-foundations of Win95. And quite a lot of my stories now in print have come to light on this tiny screen. Not the brightest of lights, I have to add. Usability of this machine is restricted by its poor performance, but portable it is indeed. CPU is a 80C88-Intel at 4,92 Mhz. It's got 128 K of RAM of which 62 are reserved for operation of the built in programs, residing in a 256 K large ROM: a word processor, a spreadsheet (supposedly 1-2-3 compatible), a calculator, a scheduler, a database for addresses and the OS of course, which is some kind of depleted DOS. Writing texts of more than say 5 K on the word processor can become cumbersome, corrections may take more than 10 seconds to fill in. I don't know anything about the other programs, because I never used them. Slung around the body of the machine is the "smart parallel interface" which accounts for connectivity to my bigger machine. The file transfer program is easy and reliable, though transfer rates are less than stellar. The screen shows eight lines of forty characters (240 x 64 pixels). You can use your standard batteries on the computer, while the additional RAM card actually slotted in on this picture uses something more special to contain its info, a very flat unit which was expected to last for two years and has been on duty for eight years now. Size (in metric numbers): the case is 20 centimeters wide, 10 centimeters deep and 2,5 centimeters high. It weighs around 350 grams. Click here to view all comments for the Atari Portfolio and to leave your own.